Posted on 12, April 2019 by EuropaWire PR Editors | This entry was posted in Automotive, Germany, News, Science, Technology, Transportation & Logistics and tagged Abstatt, acoustical phenomena, Acoustics, acoustics analysis, acoustics lab, acoustics test center, automotive engineering, Bosch, Bosch Engineering, chassis dynamometer, harshness, Jörg Vetter, noise, NVH expertise, Robert Bosch GmbH, soundproof hemi-anechoic chamber, vehicle acoustics, vibration. Bookmark the permalink. ABSTATT, 12-Apr-2019 — /EuropaWire/ — Bosch Engineering has announced it is setting up a new acoustics test center in Abstatt, a municipality in the district of Heilbronn in Baden-Württemberg in southern Germany, aimed at improving NVH (noise, vibration, harshness) in vehicles. Bosch Engineering is a subsidiary of Robert Bosch GmbH that is specialized in development services for vehicle and engine manufacturers. 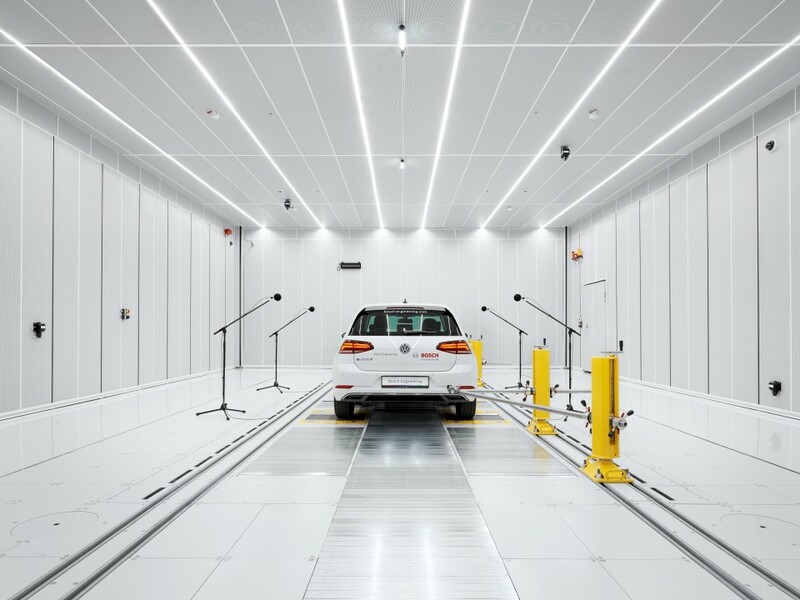 The newly set up acoustics test center brings NVH expertise to Bosch Engineering’s range of development services, sets the stage for an efficient development process to improve NVH and aims at reducing development times while enhancing vehicle acoustics. Acoustics in the vehicle are already seen and considered as a quality criterion in today’s cars. Annoying automotive noise can be caused by audible or perceptible vibrations emanating from individual components during the motion of the vehicle conveyed by the vehicle’s structure and rendered as airborne sound. Known as NVH, which stands for noise, vibration, harshness, among acoustics experts minimizing it through analyses is a fixture of automotive engineering. Acoustics are considered a major issue in the automotive engineering. From government regulations to car buyers and owners there are certain limits and expectations for external noise levels. New electric and hybrid vehicles also present considerable and often very specific challenges for acoustics experts working on improving NVH. Acoustics need to be included early on in the development process, when new models are still on the drawing board. Bosch Engineering relies on holistic engineering approach focused on optimizing the vehicle in supporting automakers’ efforts to improve NVH. Bosch Engineering provides a comprehensive service package to its customers covering the entire product development chain for a new vehicle. From an advice in the design phase to the support in the development phase, it all helps customers to continue improving their vehicles’ NVH behavior. In general, acoustics engineers test-drive cars on public roads or private test tracks to research into their acoustics. However, when testing on the open-road external factors such as ambient noise, weather conditions or the driver’s profile may impact the measured results. This results in often long and tedious tests with results that are hardly reproducible. Now, assessing vehicles’ NVH performance in Bosch Engineering’s state-of-the-art acoustics test center in Abstatt has just come closer to an ideal environment. The new test center relies on a soundproof hemi-anechoic chamber isolated from the outside world that makes testing and comparing new or modified components and calibrations under uniform conditions and with a view to their impact on the overall vehicle way more efficient. All this helps reduce cost and time involved in engineering new cars’ acoustics and optimizing legacy vehicles’ acoustics. Custom and reproducible, the development center’s measurement, analysis and evaluation procedures aim at rapidly assessing and optimizing acoustical phenomena. “In our test center, we can quickly detect noise sources that impair driving comfort and develop countermeasures together with our customers,” added Jörg Vetter. Specially equipped chassis dynamometer is the centerpiece of Bosch Engineering’s acoustics test center in Abstatt. It can be used for all type of vehicles and drives, from combustion engine, a hybrid drive and an electric drive to all-wheel, front-wheel and rear-wheel drivetrains. The four independently controllable rollers deliver 150 kW each for speeds up to 250 km/h. Various wheel torques can be simulated such as a cornering car and wheel loads. A well-insulated test cabin and silent rollers reduce background noise to a minimum so engineers can detect and measure even very low sound pressure levels. This feature represents a great competitive advantage, especially when it comes to testing electric vehicles. Having no combustion engine to mask automotive noise, the acoustics of powertrain peripherals are far more perceptible. Hydrogen vehicles are also covered by the test bench design, which includes specific monitoring functions for them. The lab, sound studio and chassis dynamometer are installed in separate rooms. The lab is equipped with precision instrumentation aimed at measuring vibration and sound pressure levels and conducting modal analyses to break down dynamic NVH behavior. The sound studio features high-tech equipment including headphones for binaural reproduction and a 13-speaker array for higher-order Ambisonics reproduction. This setup enables engineers at Bosch to compare diverse components’ acoustic behavior in the virtual realm without having to install them in the actual vehicle. It is also possible to switch between two NVH scenarios at the push of a button for A/B comparisons. Upstream from the testing area is an assembly hall. It serves as a staging area to prepare vehicles for tests. The test center has capacity for preconditioning up to ten cars simultaneously, which offers an efficient means of executing even very extensive sets of measurements and achieving reproducible results.